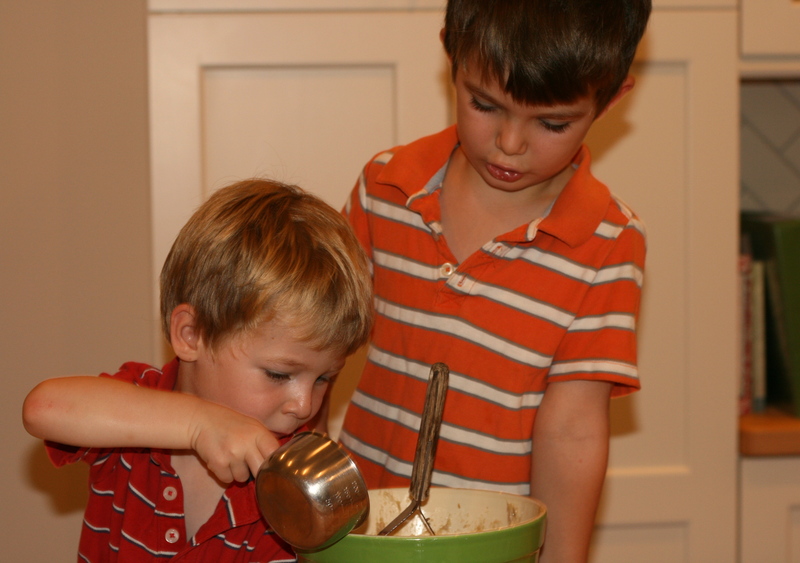 The boys love to cook and I love the idea of them cooking, but it’s hard for me to let them in on the action. Jay always wants to crack the eggs into the boiling water for poaching, but I wince just thinking about the slow, shell-y way his eggs break apart. They like to bake, too, but when flour starts billowing across the countertop, I usually step in. 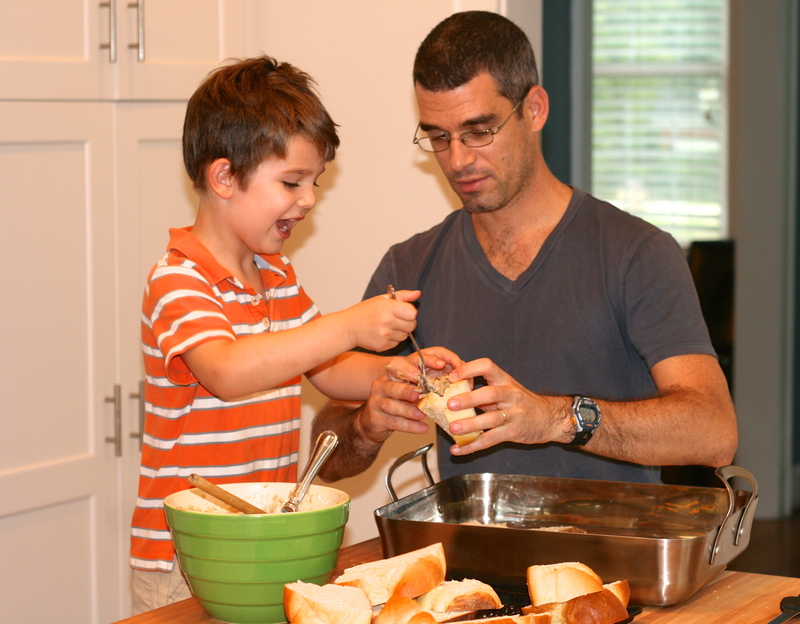 This weekend, though, we found the perfect father-son recipe: banana-stuffed french toast. It’s perfect because, after the sauce has been cooked, each step in the process lends itself to the blunt, messy way kids like to interact with food. 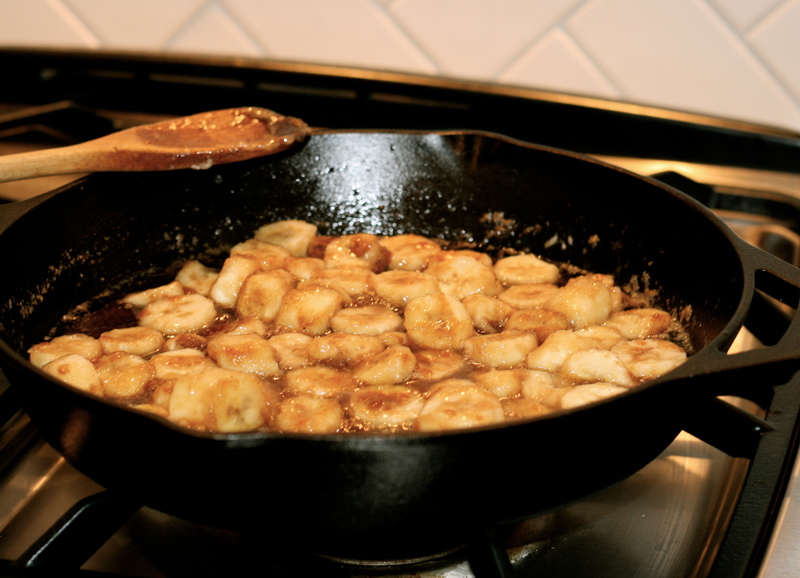 Use a potato masher to combine cream cheese and caramelized bananas? Wally can do that. Stuff gooey filling into envelopes of challah bread? Jay’s the man for the job. On top of that, the final product is so very good. As in, it shows up on your plate and you can barely believe that something so intensely delicious is being served on your dinnerware, out of your kitchen. Breakfast I: Banana-stuffed french toast. We sliced the challah the night before and left it out to stale, and also added a half-cup of walnuts, which for some inexplicable reason the recipe didn’t call for. We used two loaves of challah to feed six adults and four kids. 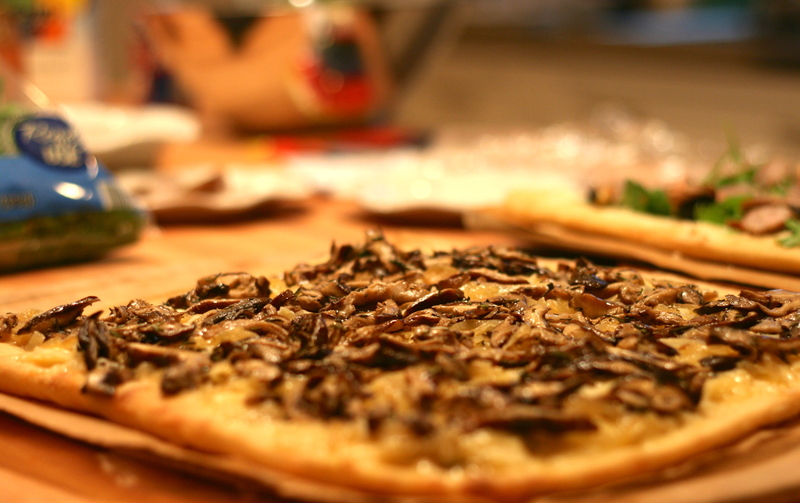 Pizza with wild mushrooms, fontina, rosemary, and caramelized onions. This is a classy pizza, tasty but subtle, a dish that lets you feel like your life is operating on a more refined epicurean level than it really is. Caroline, who’s always looking for these kinds of angles, came up with the smart idea to precook the crust for five minutes before adding the toppings and putting the whole thing back in the oven. This let the crust get crispy without burning the cheese. 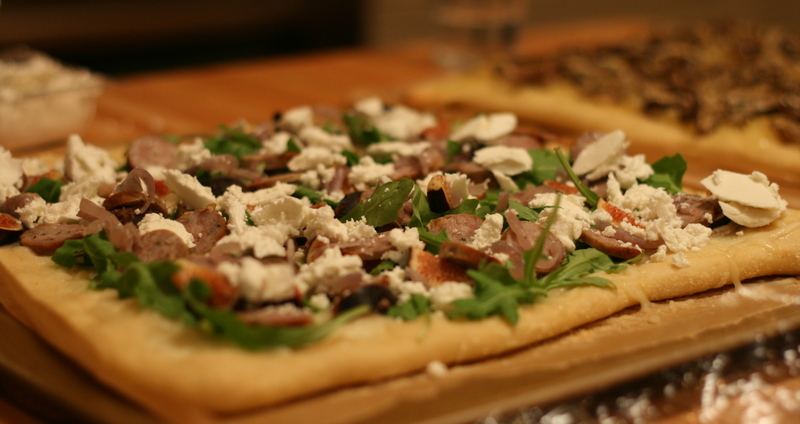 Pizza with grilled sausage, figs, goat cheese, and arugula. This is more of a “everything and the kitchen sink” pizza, and it all works well together. The figs, especially, were a pleasant surprise each time I bit into one. Dinner II: Easy pasta with tomatoes, bacon, and ricotta. We learned this recipe from my sister-in-law and it’s one of our favorite last-minute dinners. Cook five pieces of bacon and set aside. Saute 1-2 red onions in a large skillet until soft. Add two cans of diced tomatoes and 1-2 tablespoons of sugar, plus salt and pepper to taste. Simmer for 30 minutes. 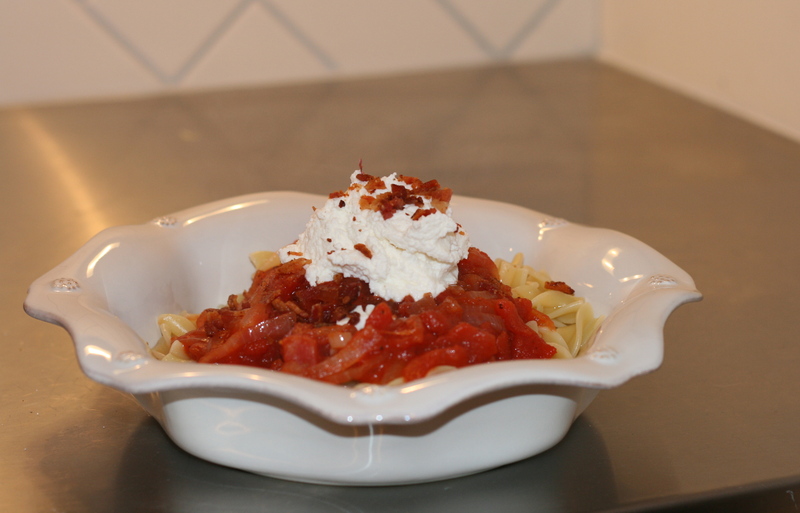 Serve the sauce over pasta, with a healthy dollop of ricotta and crumbled bacon. Dinner III: Baked salmon in teriyaki sauce, served with steamed broccoli and couscous. Dinner IV: Crab cakes with french fries and broccoli. The crab cakes are 4 for $10 at Earthfare this week, and the french fries are frozen. We’ll have this on Wednesday night, just before we hurry off to soccer practice. This entry was posted in Uncategorized by Kevin Hartnett. Bookmark the permalink.